Prestige Finished Solutions - Bathrooms, Kitchens based in Oakengates, Shropshire. 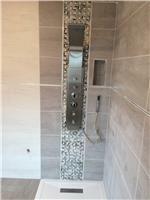 PRESTIGE FINISH SOLUTIONS is a successful family run company, undertaking construction projects throughout the west midlands.Based in Telford, we have worked for a wide range of clients, both domestic and commercial. We pride ourselves on our dedication, reputation and commitment to construction – the right way. Our dedicated, loyal team have considerable experience across a broad range of construction disciplines. This includes our own full complement of design professionals, co-ordinators and Project Managers to enable us to offer high quality Design & Build services as well as more traditional project solutions in all sectors. We are highly experienced in both new build projects and complex extension and refurbishment services. Please call us if you need the following services, we are quick to give free no obligation quotes & a fast start date of any project.